See how to add a pocket for gifts of money to your handmade tall greeting card or a quarter-fold card. With this card, there is no need for a separate money envelope, and the integral pocket is a safe and secure place for cash or checks. 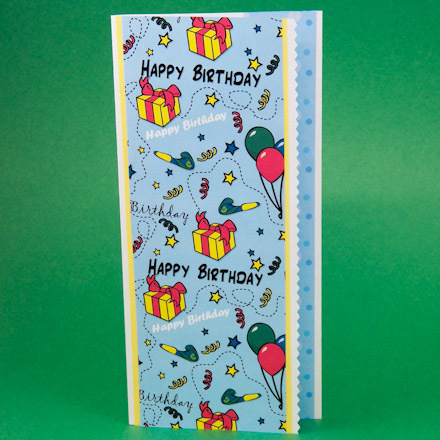 The tall card blank in this project fits into a standard business-size envelope (#10 or DL) and quarter-fold cards fit into invitation-size envelopes. See Envelopes to Make for invitation-size envelope templates. 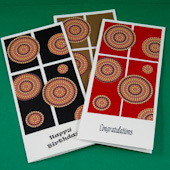 The card front can be decorated as in Card for Him or using any technique featured in the Greeting Card Class tutorials. If you are new to card-making, review these tutorials for greeting card ideas and basic techniques. 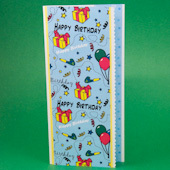 Tall card: Score fold lines across the width of the cardstock at 4" (100 mm for A4) and 8" (200 mm) from the left edge. Fold the cardstock over on the fold lines, making sharp creases. 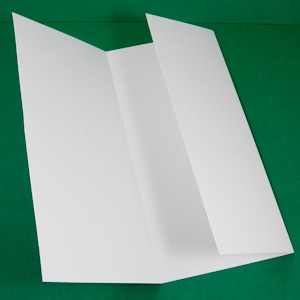 Quarter-fold card: Cut the letter-size (A4) cardstock lengthwise at 5.5" (150 mm for A4). Using the larger piece, score fold lines across the cardstock width at 4.25" (105 mm for A4) and 8.5" (210 mm). Fold the cardstock over on the fold lines, making sharp creases. To score: Lay the ruler across the cardstock where you want to make a fold. Draw the bone folder or empty ballpoint pen along the edge of the ruler to make an indent, not a cut. 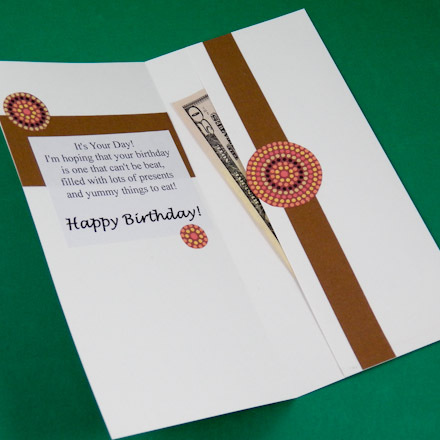 Glue the folded right side to the card to form the money pocket. Apply a narrow band of glue to the top and bottom edges. Be sure to leave the side open. 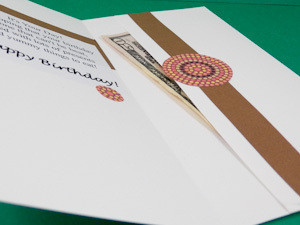 Decorate the money pocket to match your card front. In the sample, a strip of brown paper and a circle medallion define the pocket. Put your verse or greeting on the left side of the card's inside. That's it! You now have a money pocket! Related craft: Use the money pocket card blank as the base for the tall greeting card idea in Card for Him. 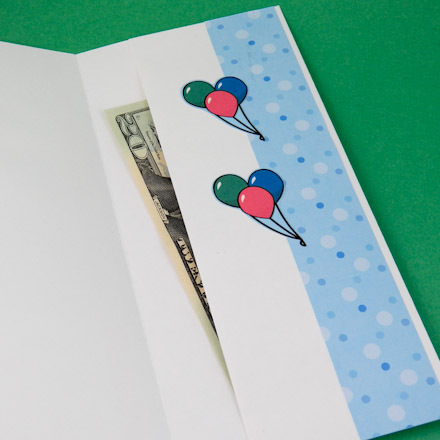 Tip: Make a birthday card with a money pocket using Aunt Annie's birthday ePaper downloads: Birthday Dots on Blue ePaper and Happy Birthday Balloons and Gifts.